The whimbrel (Numenius phaeopus) is a wader in the large family Scolopacidae. It is one of the most widespread of the curlews, breeding across much of subarctic North America, Europe and Asia as far south as Scotland. This is a migratory species wintering on coasts in Africa, South America, south Asia into Australasia and southern North America. It is also a coastal bird during migration. It is fairly gregarious outside the breeding season. This is a fairly large wader though mid-sized as a member of the curlew genus. It is 37–47 cm (15–19 in) in length, 75–90 cm (30–35 in) in wingspan, and 270–493 g (9.5–17.4 oz) in weight. It is mainly greyish brown, with a white back and rump (subspecies N. p. phaeopus and N. p. alboaxillaris only), and a long curved bill (longest in the adult female) with a kink rather than a smooth curve. It is generally wary. The usual call is a rippling whistle, prolonged into a trill for the song. The only similar common species over most of this bird's range are larger curlews. 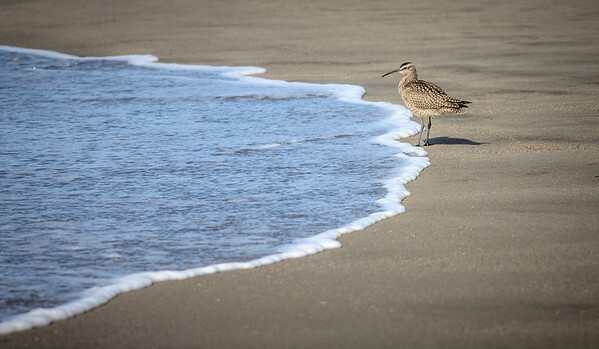 The whimbrel is smaller, has a shorter, decurved bill and has a central crown stripe and strong supercilia.